2) That we give away a perecentage of the profts to charity. This warmed our hearts, since charitable giving is such a huge part of our family’s modus operandi. To think that some of our guiding principles were rubbing off on our kids unprovoked. The story of the Menurkey’s improbable success is well documented, so needless to say we found ourselves in a very lucky place to be able to give any of the profits away. 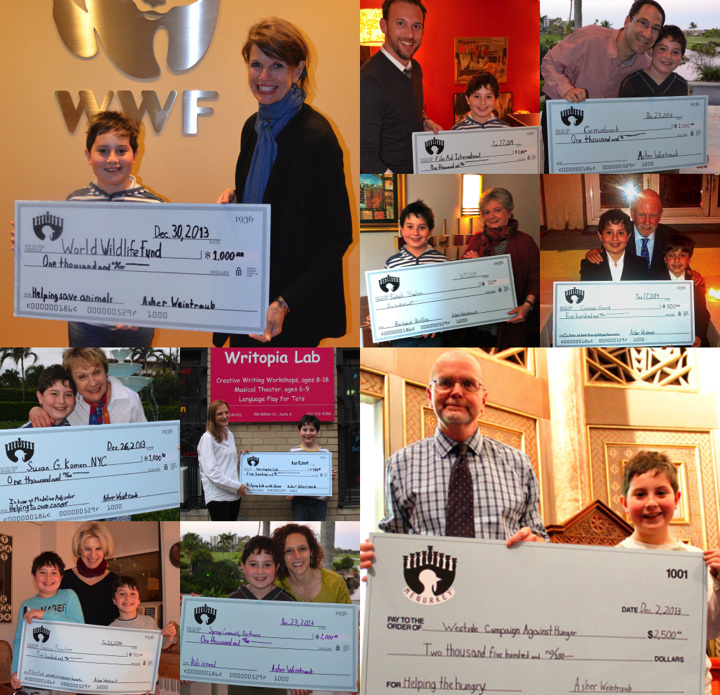 We’re happy to report that since its inception the Menurkey has given away over $13,000 to 13 non-profit organizations, most causes hand-picked by Asher himself. It’s been a pretty amazing tour, and I would be remiss if I didn’t list the very worth organizations here, just in case you feel like joining us in spreading the love. The Westside Campaign Against Hunger is a community-based emergency food program and social service agency, alleviating hunger and creating a culture that promotes self reliance. Spring Community Partners creates and strengthens community-wide links and provides guidance and assistance to support children’s educational, recreational and social activities in the Village of Dobbs Ferry, NY. Senza Frontiere/Without Borders is a film festival dedicated to show films that embrace our common humanity, using film as an opportunity to expose powerful individual stories, and teach us how we all can transcend mental and physical borders to effect peace. The Susan G. Komen Foundation works globally to end the scourge of breast cancer, playing a critical role in every major advance in the fight, transforming how the world talks about and treats this disease and helping to turn millions of breast cancer patients into breast cancer survivors. The World Wildlife Fund is the world’s leading conservation organization, working to conserve nature and reduce the most pressing threats to the diversity of life on Earth. FilmAid International (founded by Asher’s mom Caroline Baron) uses the power of film and media to transcend language and literacy, bringing life-saving information, psychological relief and much-needed hope to refugees and other communities in need around the globe. Groundwork Hudson Valley works to make neglected neighborhoods in the lower Hudson Valley more livable and sustainable through an array of on-the-ground environmental projects that directly involve local residents, especially youth. Common Ground strengthens individuals, families and communities by developing and sustaining exceptional supportive and affordable housing as well as programs for homeless and other vulnerable New Yorkers. Backpack Buddies, a program of Manhattan’s Congregation Rodeph Sholom, serves children who are food insecure (meaning they do not have access at all times to enough food for an active, healthy life) by currently distributing 35 backpacks full of food weekly through the Lincoln Square neighborhood Center. Writopia Lab is a literacy and writing workshop dedicated to growing a national community of young writers. Faustman Lab supports the research of Denise Faustman, Director of the Immunobiology Laboratory at the Massachusetts General Hospital whose current research focuses on discovering and developing new treatments for type 1 diabetes and other autoimmune diseases. Kids Creative offers arts-based, peace education programs for Pre-K to High School age students through after school programs, workshops and summer camps, fostering confidence, creativity, conflict resolution, community, and collaboration through arts education programs and live music and theater events. The Crohn’s & Colitis Foundation of America/No Colon, Still Rollin’ works to cure Crohn’s disease and ulcerative colitis and improve the quality of life of children and adults affected by these diseases. This link supports Asher’s friend Luc Hyman’s team in the 2014 Take Steps for Crohn’s & Colitis Walk. We’d like to thank all of these wonderful organizations for the hard work they do to make the world a better place. As we continue to sell Menurkeys we’ll continue to pass some of that love on to those that need it most. After handing the fourth or fifth ‘big check’ off to one of the wonderful stewards of these incredible organizations, Asher said he’d always known how great it made him feel to get things, but now he realized how amazing it felt to give.